Grp78, is a 78 kDa glucose-regulated protein, also known as BiP or immunoglobulin heavy chain binding protein, is a stress-response protein which is induced by agents or conditions that adversely affect endoplasmic reticulum (ER) function. This protein is essential for the proper glycosylation, folding and assembly of many membrane bound and secreted proteins. Grp78 is critical for maintenance of cell homeostasis and the prevention of apoptosis. Grp78 protein levels have been shown to be a reliable biomarker of hypoglycermia as well as serving a neuroprotective function in neurons exposed to glutamate and oxidative stress. Grp78 levels are reduced in the brains of Alzheimer's Disease patients and decreased expression of Grp78 is found associated with missense mutations in the human presenilin-1 (PS1) gene. The induction of the Grp78 protein has been associated with the development of drug-resistance to antitumor drugs. 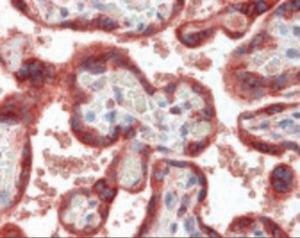 HSPA5 antibody can be used in ELISA, Western Blot, immunohistochemistry starting at 5 μg/mL, and immunofluorescence starting at 10 μg/mL. PBS, 0.2% gelatin, 0.05% sodium azide. Aliquot and store at -20°C or below. Avoid multiple freeze-thaw cycles.